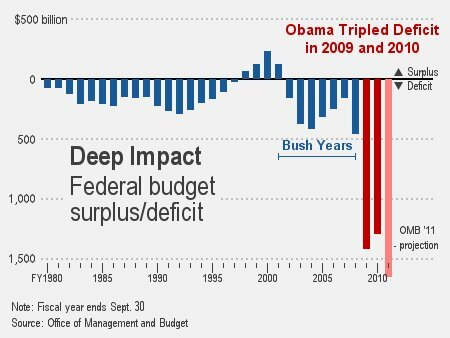 Obama said he was going to cut the deficit in half back in 2009. Instead he tripled it his first year in office and it’s only getting worse. He’s also the worst jobs president since the Great Depression. President Obama is heading to Ohio today to defend his awful record. Under pressure on unemployment, President Barack Obama will remind voters that his 2009 auto bailout saved thousands of jobs in a visit on Friday to Ohio, a state vital to his re-election hopes. Obama will arrive at a Chrysler Group Llc plant in Toledo hours after the release of a monthly employment report that delivered Americans a stark reminder that the labor market remains weak and unemployment high. The numbers follow a rash of data signaling the economy may be losing steam. Obama, a Democrat, must coax the jobless rate down convincingly in order to be confident of securing a second White House term. Polls show he is still favored over all potential Republican opponents. But the troubled economy remains his biggest weakness, and that vulnerability was underscored by a disappointing May jobs report on Friday that saw unemployment nudge up to 9.1 percent from 9.0 percent in April. For the record… The Wall Street Journal reported yesterday that the auto bailout may cost American taxpayers $14 billion.